Separate licensing was a major challenge for most healthcare professionals especially for agencies that had operations in different locations across the emirates, and when hiring qualified staff from India or Philippines. Healthcare professionals in the UAE have been waiting for a solution to this problem for some time as this will offer them broader chances of employment from various emirates. If you are a DHA passer but is willing to work in Abu Dhabi and is worried about spending again for another licensure examination, then there is good news for you! The Dubai Health Authority (DHA) and Health Authority-Abu Dhabi (HAAD) came up with a revolutionary agreement to unify licensing procedures of various healthcare professionals. It is a signed memorandum of agreement wherein an individual who is practicing his or her medical profession, will be able to convert or transfer medical license from one issuing authority to another, such as DHA to HAAD. This change aims to revive the recognition of medical licenses of different healthcare professionals across the region. The law would help standardize several aspects of medical services both in private and public sectors. This ensures a single format for hiring and job salaries as salaries vary between emirates, with healthcare professionals working in Abu Dhabi often earn more than their counterparts in the Northern Emirates. Now, numerous medical professionals will be available in the market as they can work in any emirate with any of DHA, MOH or HAAD licenses. With this unification process, UAE has become an oasis of cultural harmony and human generosity as they are willing to accept thousands of medical professionals to work in various emirates. It may sound simple but still some questions are asked on how to correctly convert DHA license to HAAD, where to begin the process? What are the basic requirements for license transfer, what are the necessary fees, how many days are needed for the whole process to be completed? You can get all the answers to these questions in this article in order for you to benefit from this memorandum. You can’t just start the procedure right after passing your DHA exam. First and foremost you have to be on a job with a valid DHA license. Secondly, you should have at least 6 months of experience on the said job. For you to get a job, you must be a DHA passer and got your Eligibility letter in your email. The Eligibility letter is a confirmation that you have passed your DHA Licensing exam and you can be appointed on a job in Dubai only. It is recommended that DHA passed candidates should call the DHA number which is 800-DHA for further inquiries. Request a Certificate of Good Standing online. You can visit this site to request one from your DHA account: https://www.dha.gov.ae/EN/ServiceCatalogue/pages/issuegoodstandingcertificate.aspx. It will cost you 510 AED for regular or normal process (usually 15 working days) while rush or urgent process costs 1010 AED (2-3 working days). You can pay online through credit cards. You can borrow from a family or friend if you don’t have one. Major credit card companies such as America Express, Master Card and Visa are usually accepted. Create a HAAD dataflow account. You can visit this site to create your account: https://www.dataflowgroup.net/haad/login.aspx. All your documents need to be scanned before uploading it. Some documents require Certificate of Authentication and Verification by the Department of Foreign Affairs. Secure your data flow report from DHA (you will find this in your account in DHA just under PSV (Primary Source Verification) section). For those who don’t have this in their account, simply e-mail dha@dataflowgroup.com to request for your data flow report. Remember to always keep your PSV receipt with you. For those who don’t have any sponsor yet, you can put in self-applicant. Also, bear in mind that those HAAD dataflow accounts in which the uploaded information and scanned documents are saved as drafts for more than two weeks already will be disapproved and closed. Make sure to finish the entire dataflow process in less than two weeks for your application to be accepted and processed. If you need further clarifications and inquiries about the process, you can e-mail them at bpasupport@haad.ae. They will immediately reply with an acknowledgement mail for your request but you must wait for another e-mail regarding further instructions on your inquiry. Wait for payment notification e-mail. You will receive an e-mail from haadorders@dataflowgroup.com that requires your payment for the HAAD dataflow. Since you have already your dataflow report from DHA, you don’t need to pay for it again. Instead, thru e-mail, reply and send them back a scanned copy of your PSV receipt along with your dataflow report and wait for their confirmation. Wait for your username and password. You will receive your username and password along with a link to HAAD website from Notifications@haad.ae. Once you logged into your account, you need to upload and fill up again all the required documents and information. Wait for their reply to your e-mail (usually takes at least 30 to 60 days) or you can check the status of your application in your HAAD account by sending e-mail to haadsupport@dataflowgroup.com. Your application will be reviewed by the licensing committee and the health professional licensing officer will update you of the status. If your application is disapproved and closed, you have the right to re-apply on e-licensing system if you have additional documents or you may appeal to the Health Professional Manager, provided that you have supporting documents. You are advised to regularly communicate with dataflow section thru e-mail to resolve any negative issue. 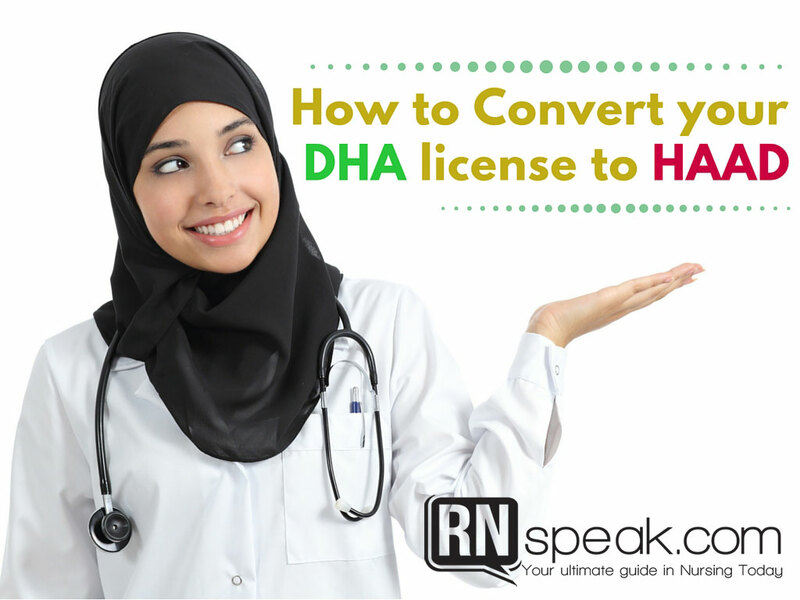 The entire process to convert DHA license to HAAD license is more or less similar for most medical professionals such as Nurses, Pharmacists, Assistant Pharmacists, Dentists, Radiologists, etc.